By Paul R. Munford, Ph.D. I remember a movie in which one of the characters went around asking people to define the word “irony.” Although most of them seemed to know what it meant, they were unable to put it into words. Not until the end of the movie did one of them give the definition. I’m reminded of this because the continuation and elimination of OCD symptoms are perfect examples of irony or the occurrence of outcomes that are opposite to those that were intended. You have probably been steering clear of triggers for your obsessions and doing compulsions after contact with those you couldn’t avoid. Ironically, instead of lessening your distress, what you have been doing is sustaining or even worsening your condition. To get out of this quagmire, you have to start doing the opposite of your strategy up until now. This means deliberately making contact with the triggers while refraining from doing compulsions. With enough exposure to the triggers, and for sufficient periods of time, you will notice that they become powerless to provoke distress, and the absence of distress eliminates the need for compulsions. See what I mean about OCD and irony? Exposure, ritual prevention, and awareness exercises are used to achieve this. It is important that you understand how the exposure, ritual prevention, and awareness (ERPA) exercises are related to the way the symptoms work. 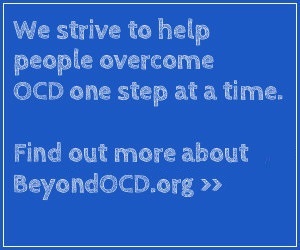 So let’s review the series of events that takes place during a cycle of OCD symptoms, commonly called an OCD spike. First, there’s a trigger, something that is noticed in your physical, social or mental worlds. Second, it instantly activates an obsession — thoughts, feelings or impulses that are distressful. Almost simultaneously, you feel fear, guilt, apprehension, dread, anger or any number and combination of distressing emotions. These three events — exposure to a trigger, activation of an obsession, and feelings of distress — are sensed as happening together, as a single event. Therefore, the terms, “trigger,” “obsession,” and “distress” are used interchangeably to refer to this seemingly single event — the spike. Your natural reaction is to turn it off as quickly as possible. Finally, by trial and error, you find out that by repeating certain actions and/or mental gyrations you get temporary relief until the next obsession hits. ERPA exercises address each one of these events. First, you select a trigger for a particular obsession-compulsion combination and then practice exposure to this trigger. During the exposure, the next step is to refrain from rituals and instead practice awareness of the distress. When this is successfully done the distress fades away. Because the obsessions that used to cause terrible anxiety no longer has that power, it becomes insignificant, making it intrusive and repetitive no more. With the absence of the obsessions, there is no need for compulsions. The exercises have changed the brain, which in turn changes behaviors and emotions. Desensitization has occurred. The exposure exercise is the vehicle, the Rolls Royce of treatments, which delivers this result. To put together an exposure exercise, you’ll be following these steps: 1. Select a trigger, an obsession-compulsion combination for elimination. 2. Practice exposure: by bringing on the obsession in reality and in imagination. 3. Practice ritual prevention by refraining from doing compulsions and fear blocking behaviors. 4. Practice acceptance fully experiencing the triggered thoughts, images, impulses, emotions and physical sensations they set off. The best obsessions-compulsion combination to target is usually the obsession-compulsion combination that is the least distressful. Even though you may be eager to get rid of the most troublesome of your symptoms, it’s best to start with the one that provides the greatest chance for success. After all, nothing succeeds like success. Don’t worry; we will eventually deal with all of your triggers. As you are aware, there will be some stress associated with the exercises you are about to undertake. So start with the easiest one first to keep the distress at a minimum. The exposures involve making contact with triggers for obsessions in reality, which are in the outer, physical and social world, or in imaginary situations, which are in the inner, mental world because fear is the problem and fear is the solution. I realize that the idea of facing fear is quite scary, but it’s necessary. In case after case, patients have reported that once they start confronting fear, they find it not to be nearly as distressful as anticipated. More importantly, they discover that exposure works. The obsessions stop triggering fear and become just “thoughts.” Being neutral with no emotional impact, they are insignificant and gradually fade away. Keep in mind that the exposure exercises are done in a most gradual way, moving toward a goal slowly. This gradual way of making progress is called shaping. Start with a situation that causes only minimal distress and stay with it until you have little or no reaction to it. Only then do you take on another situation, one that’s only slightly more difficult than the first one, and stick with it until the distress evaporates. This process is continued until you have been thoroughly exposed to all of your obsessions, including what you initially estimated to be the most frightening. By the time you get to it, you will have been desensitized by the exposure exercises leading up to it, so that the final step will be no more difficult than the first one. This process, moving toward a goal in small steps, is an important part of the recovery process. For exposure to succeed in erasing the fear, there are two necessary conditions. First, rituals, and any other means of dodging the exposure, must be prevented. The use of false fear blockers will be fully discussed in the next section. For now let’s discuss the second of these conditions, the need for prolonged exposure. Exposure sessions must be long enough for you to experience a noticeable decline in your distress during the exposure. This means your sessions could be for an hour or more. What people typically feel during their sessions is a gradual rise in distress, which levels off after several minutes. Then it starts to decline. It is during this phase that you‘re receiving the benefits of the exercise. Whatever the trigger, it’s losing its power to provoke fear. With the next exposure session, and subsequent ones, you’ll find that the fear at the beginning is lower and falls away faster, until eventually you’ll feel little or no distress. You will have neutralized the trigger, and learned that exposure alone will free you from anxiety without resorting to the use of faulty fear blockers. Keep your exposure sessions to no more than 90 minutes by selecting triggers that are in the mild to moderate range of difficulty. Exposure can be mentally and emotionally draining, so you don’t want to cause an unnecessary hardship by overdoing it. If you underestimate the power of a trigger and find that it’s taking more than 90 minutes for the distress to decrease, stop working on it and replace it with an easier exercise. You can return to the one you underestimated after the easier exercises have desensitized you. As mentioned above, exposure exercises can be in reality or in imagination. Exposures in reality aim to eliminate obsessions triggered by situations in the real world, your physical and social environment. Exposure activities of this kind require being physically involved with situations that trigger obsessions. Exposures in imagination aim to eliminate obsessions triggered by thoughts and images of imaged dreaded future events that are impossible and improbable. Exposures of this kind, since they exist only in your mind’s eye, require contact with the imagined triggers. One of the best ways to do exposure in imagination is by writing down the content of your obsessions and recording this scenario on audiotape and listening to it repeatedly for as long as it takes to feel some relief. You can also practice exposure to this scenario by rewriting and rereading it for extended periods of time, again, until you feel your distressed lessening. For both types of exposure exercises, it is of the utmost importance that you do not stop them while your anxiety is up. If you do, desensitization is prevented and you can even be further sensitized to the situation you’re trying to neutralize. With this in mind, schedule your exposure sessions at times when you have enough time to complete them, and know that you will not be interrupted, or distracted. The best results are obtained when you practice every day, including weekends and holidays. A momentum develops that makes the practice easier with faster results. I also recommend that you do the exercises early in the day. This way you’re less likely to put them off and the thought of doing them is not hanging over your head like the sword of Damocles for the bulk of the day. A false fear-blocker is any action or thought immediately following an obsession that reduces the fear. I use the term “false” because the reduced fear is only temporary and returns with the next obsession. Its greatest harm is blocking exposure, which prevents recovery. The most common false fear blockers are: physical and mental compulsions; distraction; avoidance; and reassurance seeking. Physical and mental compulsions are voluntary actions that are under your control. Just as you can control the movement of your muscles, you can control the performance of physical rituals. The same is true for mental rituals; they are willful words that you say to yourself and images that you purposely produce. The question isn’t, “Can I prevent rituals?” but, “Am I willing to prevent them?” If you wish to overcome OCD the answer must be “yes.” The price you’ll pay for giving them up — short-term, mild anxiety — is well worth the long-term benefit of freedom from OCD. The old saying, “it’s easier than you think”, has been found to be true by all the courageous people who have abandoned rituals and overcome their suffering. You can be one of them. Remember that by shaping your exposures you can control your anxiety level, which will make it easier to relinquish the rituals. Avoided situations can be your ally when you recognize that they are actually triggers for your obsessions, and as such, targets for desensitization. When they have been neutralized, and you are able to easily approach them, you will have demonstrated the ultimate proof of a successful treatment outcome. Reasoning is probably the most commonly used fear blocker even though the person realizes, most of the time that their fears are unreasonable. However, during severe OCD spikes, this understanding weakens and doubts arise that the dreaded thoughts could be real. For example, could the thoughts really mean that “I have a major character defect or that I am crazy?” Just as nature abhors a vacuum, humans abhor uncertainty. We deal with it by rationalizing, analyzing, intellectualizing, theorizing, and using all kinds of mental manipulations attempting to achieve certainty. This happens in OCD when the faulty fear blockers of reasoning, “thinking things through,” and challenging irrational thoughts are called into play. As you already know, these efforts at relief are futile. We have little direct control over our emotional reactions because emotions happen to us, they’re not things we will to happen. Our rational control of fear is weak; but fear can easily hijack rational control, doing so routinely in OCD. This is because the connections from the brain’s emotional systems to the rational systems are stronger than connections from the rational systems to the emotional systems (LeDoux, 1996). Philosophers, poets, and other sages have expressed this understanding over the centuries, and joining them today are neuroscientists reporting discoveries about how the brain works. Remember, with fear, what you think won’t help you, but what you do will. Reassurance is one of the most powerful and unrecognized of these fear and recovery blockers. It’s a form of compulsion that are I’ve found in over 90 percent of the people I’ve worked with. Because so many compulsively seek reassurance to calm their OCD and anxiety, it deserves special attention. People with OCD worry that their obsessions might come true. To ease this distress they ask other people, usually family members or close friends, over and over again to reassure them that their fears will not materialize. Because obsessions are always unrealistic, the family members or friends (and even therapists) tell them there is no need to worry; nothing bad is going to happen. For instance, it is quite common for people with fears of being irresponsible or careless to seek reassurance that they are neither. Typically they get the reassurance that they want, and temporary relief, but like other compulsions, reassurance blocks recovery. This is the first paradox. Reassurance is not helpful — it’s harmful. However, the short-term relief it provides is rewarding enough to keep the person repeatedly seeking more, which is the second paradox. The more reassurance received, the more reassurance wanted. Trying to satisfy the demand is like trying to fill a bottomless pit. In addition to hindering recovery, incessant requests for reassurance can grow to be overbearing demands that lead to interpersonal strife. In one case, after her husband’s demands became so intense and frequent, one woman actually moved out and rented an apartment of her own. Her husband entered an intensive treatment program where both were helped and the reassurance stopped. This is an example of the third paradox. Once reassurance is eliminated, the reassured finds no further desire for it accompanied by a decrease in their obsessions and other compulsions. How, then, should you handle your urges to ask for reassurance? First. Stop asking for reassurance. Identify your most frequent questions and do not ask them. Avoid subtle, indirect ways of getting reassurance. These may be unknown to the reassurers, but knowingly practiced by you. For example, one client I worked with would abruptly stop doing whatever she was doing, sit down and space out. Her husband learned that these behaviors signaled that she was caught up in obsessions, and unbeknownst to him, they became a nonverbal request for reassurance that he would immediately provide. It was his cue to begin telling her not to worry, that her fears were irrational, that it was only her OCD. So in addition to attending to the obvious requests, subtle, indirect ones also need to be stopped. Second. Educate your significant others about the harmful effects of reassurance. Have them read this passage. Explain that providing reassurance interferes with recovery. Third. Create a gentle refusal statement. At first, you will most likely continue to seek reassurance despite your efforts to abstain from them. Therefore, people from whom you typically get reassurance need to work with you to create a palatable way to say no. One way of doing this is for them to say, “I think you’re asking for reassurance. Remember, reassurance is not helpful; it’s harmful. Therefore I’m not going to respond.” However, if this doesn’t work, it’s possible that the agreed upon statement itself has become reassuring, or that you believe that nothing bad will happen because the reassurer would warn you. In this case, the best way to end it is for the parties to stop talking about OCD entirely. I guess everybody’s heard that you must face your fears to overcome them. That is easy to say but hard to do. Our instinctive reaction in the face of threat is fight or flight. This reaction has survival value for dealing with true dangers, but not for the false dangers you fear with OCD. Survival for you is overcoming OCD, which requires experiencing the fear, sticking with it, immersing yourself in it, and subduing it. Reading this may stoke anticipatory fears, but keep in mind that you can control your fear levels by approaching the triggers gradually so that you feel only mild to moderate levels or of anxiety. On making contact, you might notice that the fear gradually rises but then levels off, and after a while it begins to decrease. It is during this last phase that you are getting the benefits of treatment. You are being desensitized. While facing the fear, your task is to pay attention to your uncomfortable thoughts, and emotional and physical sensations. Dwell on the scary thoughts and images. Do the opposite of what you have been doing and accept the fears as being possible. Imagine the dreaded future events happening. Say to yourself, “So be it.” Concentrate on the prospect of living in a world of uncertainty, of never knowing if and when something bad is going to happen, of never getting over the anxious condition, and so forth and so on. Keep thinking about thoughts and calling up images to deliberately provoke fear. In this way you are using fear to fight fear. You can’t overcome fear by trying to go around it but only by going through it. Really be aware of the emotions you are experiencing. Also notice your body’s physical reactions. Where do you feel the anxiety in your body? If your heart is beating faster and harder, tune in to it. If you have muscle tension, focus on that. If you’re breathing faster and harder notice it. Are your stomach and chest tight? Do you feel hot? Are you sweating? If the answer is yes, it means that you are on the right track because you’re feeling the fear and letting it burn itself out. By pursuing the fear, you are destroying it. Exposure is to obsessions and compulsions as sunlight is to vampires. All of these bad feelings are for the good. You’ll know this for yourself when, after several exposures, the fear no longer exists. You won’t be able to summon it even if you try. However, you might be concerned that the obsessions will become stronger if you give up your efforts to stop blocking them or if you deliberately bring them on. Or you might worry that whatever you dread will happen. Paradoxically, neither of these outcomes occurs. Instead, the exact opposite happens; you will recover as a result of re-training your brain’s fear system to stop making false alarms about harmless events. You will be desensitized to the previous fear triggers and see them as they truly are — harmless thoughts and images that are simply part of the normal flow of your stream of consciousness. In other words, OCD is erased when the unwanted thoughts, images, and impulses are faced, and embraced. You may ask, “If exposure to fear is all that’s required to get over OCD why hasn’t this already happened? I’ve had these obsessions for many years and they just keep coming.” The answer is that you have used futile fear-blockers to cut off distress from the obsessions. This means that your exposures to the fear haven’t been long enough for it to naturally drop, which it will, simply as a result of your feeling it. You will fully understand the truth of this after you’ve completed your first exposure exercise. Good luck. You’ve got the power! Reprinted with permission: New Harbinger Publications, Inc. Copyright 2004 by Paul R. Munford, excerpted from “Overcoming Compulsive Checking.” Paul R. Munford, Ph.D. is a clinical psychologist and director of the Cognitive Behavior Therapy Center for OCD and Anxiety, San Rafael, CA.